By joining the Oyster Restoration Workgroup we hope that your participation will help to increase professional contacts, facilitate interactions among disciplinary (e.g., municipal planners and research scientists) and geographically disparate groups, and ultimately develop new or unique networks of individuals interested in oyster reef restoration and related topics. NAS (2017). The Committee on Effective Approaches for Monitoring and Assessing Gulf of Mexico Restoration Activities report on Effective Monitoring to Evaluate Ecological Restoration in the Gulf of Mexico, The National Academies of Sciences, Engineering, and Medicine. Washington, D.C., 219pp. DOI: 10.17226/23476. Oyster reefs play a key role in this document, along with wetlands, seagrass, birds sea turtles and marine mammals. In order to ensure that the restoration goals are met and money is well spent as funded for these restoration efforts, restoration monitoring and evaluation are discussed as integral parts of these programs. Assessments of past restoration efforts have shown that monitoring is often inadequate or even absent. See link to get a PDF copy or to order the final version. You can download after creating a free MyNAP account or receive a discounted hard copy. The Handbook developed by a group with experience on issues related to oyster restoration from Atlantic, Pacific, and Gulf of Mexico (U.S.) states is now available. It includes a set of standardized monitoring approaches to quantify oyster restoration-related metrics. Its ultimate goal is to allow for more rigorous comparisons among areas and projects. The monitoring metrics and performance criteria were designed to address both the Eastern oyster, Crassostrea virginica , and more generally the Olympia oyster, Ostrea lurida . For additional information, see the drop-down items under the Restoration Practices menu item at the top of this page. For the pdf click here. For a hard copy contact Boze Hancock (bhancock@TNC.ORG) at TNC. The citation is: Baggett, L.P., S.P. Powers, R. Brumbaugh, L.D. Coen, B. DeAngelis, J. Greene, B. Hancock, and S. Morlock, 2014. Oyster habitat restoration monitoring and assessment handbook. The Nature Conservancy, Arlington, VA, USA, 96pp. 72nd Annual Shellfish Conference & Tradeshow, Sep 18, 2018 – Sep 20, 2018, Semiahmoo Resort, 9565 Semiahmoo Pkwy, Blaine, WA (see http://pcsga.org/annual-conferences/). This guide is intended to assist natural resource managers and restoration practitioners in making the case for oyster restoration and in setting quantitative objectives for restoring and managing oyster reefs and beds at an estuary or bay-wide scale. Determining the area of oyster restoration required has numerous applications. Ultimately the objective for oyster reef restoration should be considered with ecosystem services to develop an ecosystem-based plan on a system-wide scale. zu Ermgassen, P.S.E., B. Hancock, B. DeAngelis, J. Greene, E. Schuster, M. Spalding, and R. Brumbaugh, 2016b. 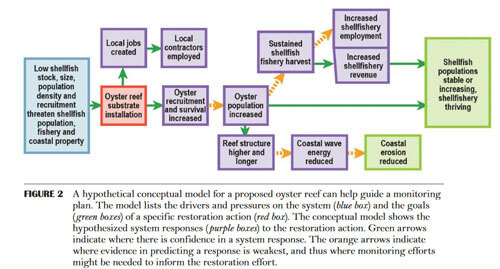 Setting objectives for oyster habitat restoration using ecosystem services: a manager’s guide. TNC, Arlington VA. 76pp. Identifies key environmental conditions affecting Olympia oysters ( Ostrea lurida ) in central California. Hard substrate, food, and relatively warm water temperatures were identified as important factors supporting sustainable oyster populations. In contrast, low salinities and DO, warm air temperatures and abundant predators (e.g, oyster drills) were found to be the most important oyster stressors. The authors used data from 21 study sites in San Francisco Bay and Elkhorn Slough for their analyses. From the Climate Change and Olympia Oysters: San Francisco Bay Subtidal Habitat Goals Project. Wasson, K., C. Zabin, J. Bible, E. Ceballos, A. Chang, B. Cheng, A. Deck, T. Grosholz, M. Latta, and M. Ferner, 2014. A Guide to Olympia oyster restoration and Conservation: environmental conditions and sites that support sustainable populations in central California, Sept. 2014, San Francisco Bay National Estuarine Research Reserve, 43pp.